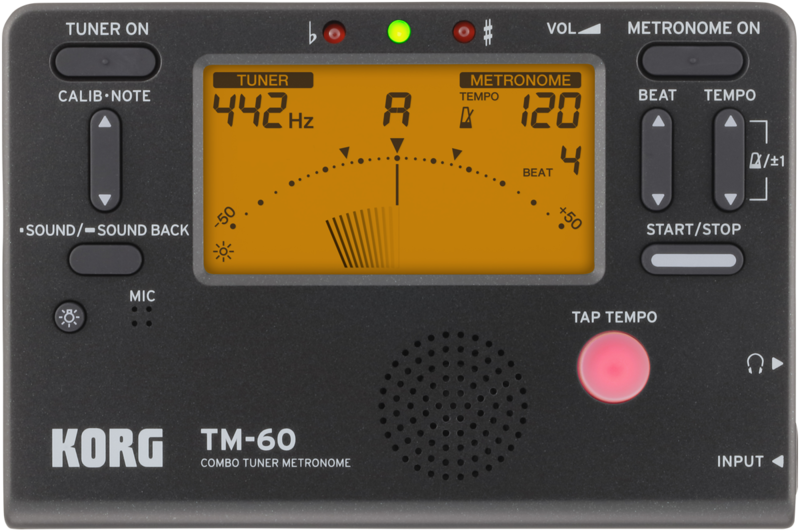 A new, larger screen shows the tuner and metronome functions　simultaneously. 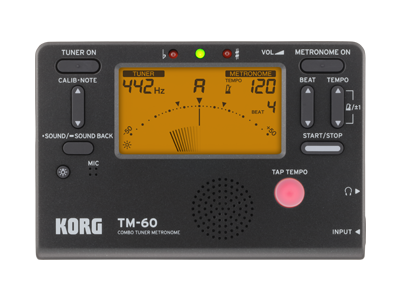 The TM-60 — a must-have item for practicing. 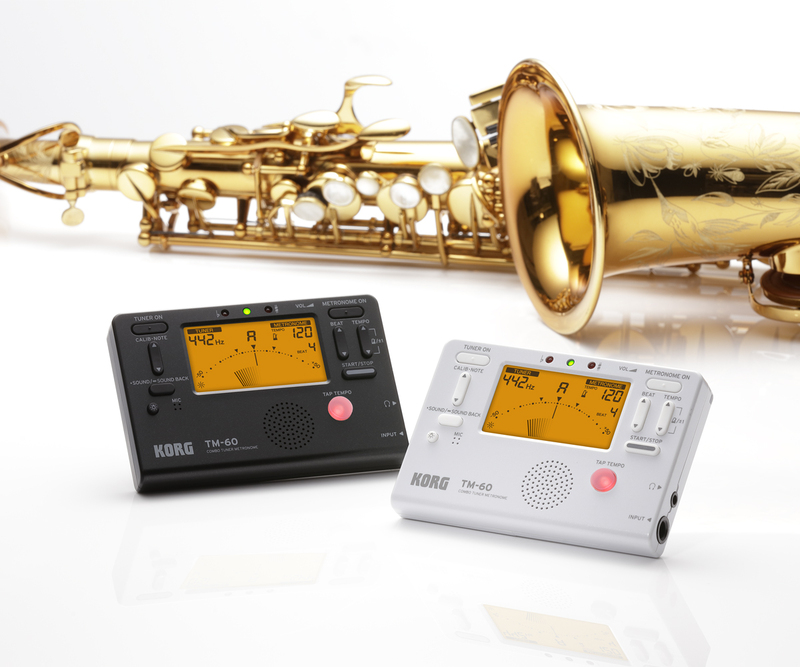 KORG’s proprietary technology accurately detects the pitch without any time lag. The pitch drift that is prone to occur during long tones played on a wind instrument can be detected before it happens, letting you train yourself to produce unwavering tone with stable pitch. 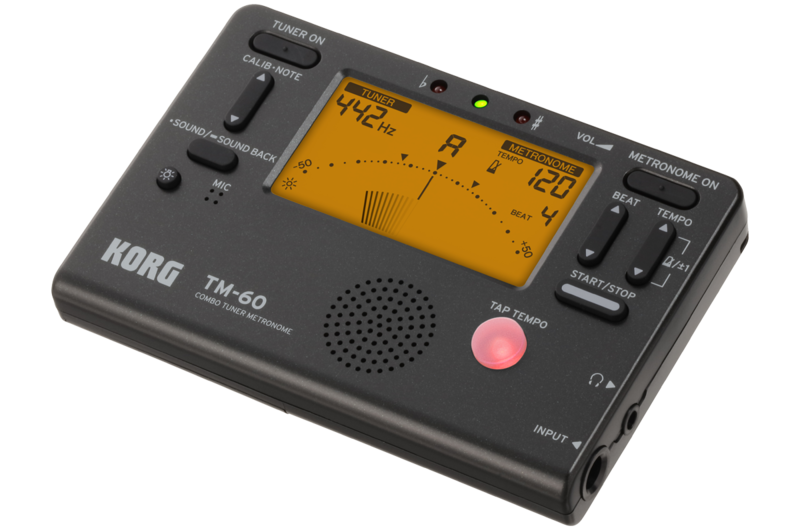 Also available in the lineup is the TM-60C, which is shipped with a CM-200 contact mic. 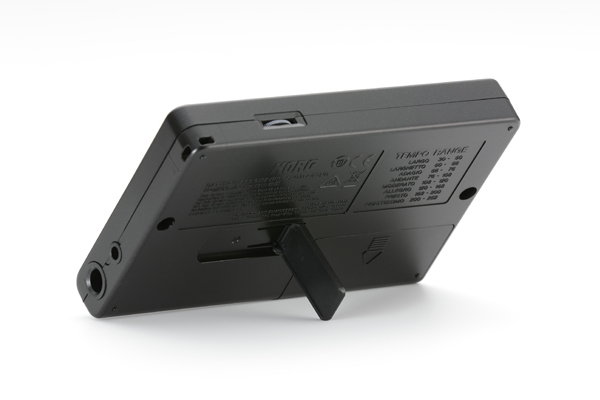 By attaching the CM-200 to your instrument, the vibrations can be sent directly to the tuner for more accurate tuning. In an ensemble such as a brass band or orchestra, harmonies of third intervals are easily perceived as out of tune, and can be made to sound better by slightly adjusting the pitch to a pure major or minor third. 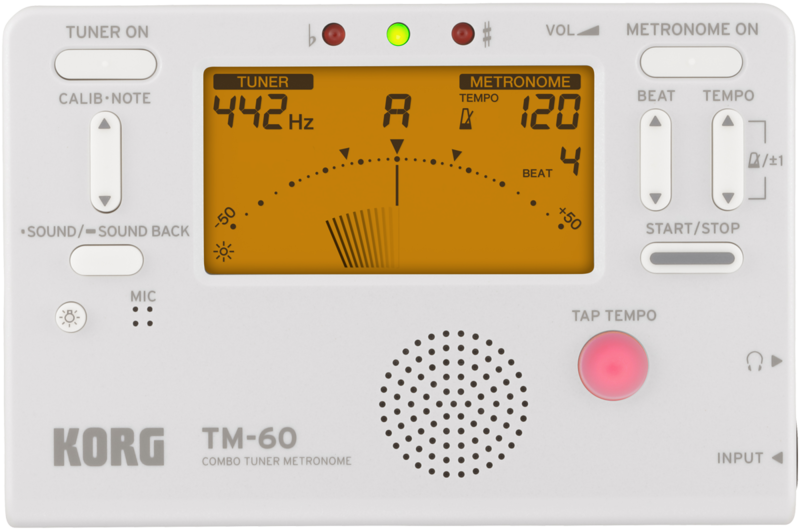 The TM-60’s meter scale provides marks that indicate pure major and minor thirds, and simply by tuning so that the needle coincides with these marks* allows you to play in beautiful harmony with an ensemble. This is convenient not only for orchestral instruments but also for vocal music or a cappella practice. * When tuning to a pure major or minor third, the specific note to be adjusted depends on the music that you’re playing. 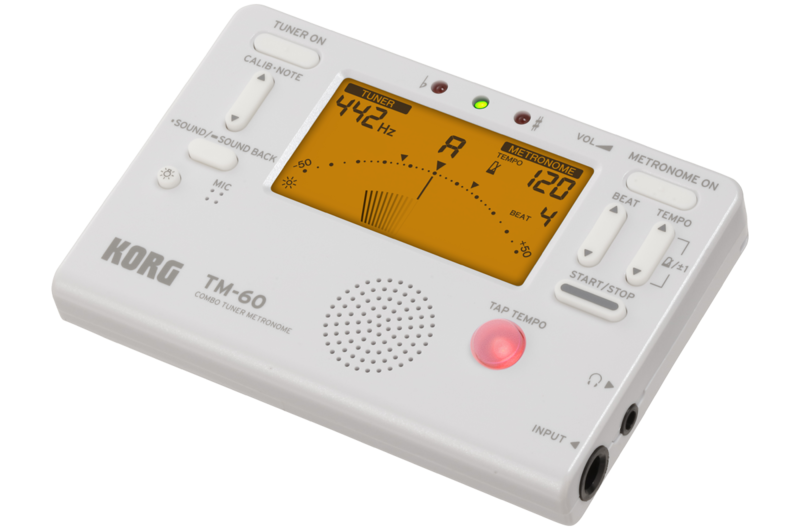 In addition to a meter for visual tuning, the TM-60 provides a "sound out" mode that lets you tune using your ear while listening to a reference tone from the internal speaker or a set of connected headphones. 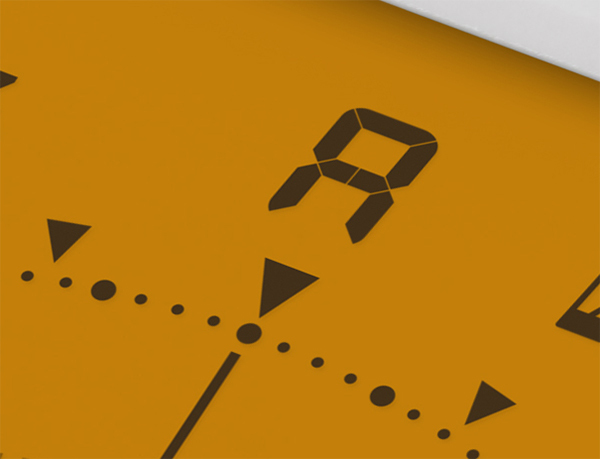 The reference tone can be selected from the three-octave range of C3 (130.81 Hz) to C6 (1046.50 Hz), supporting not only wind instruments but also a variety of other instruments. *This function is available when there is a connection either to the INPUT jack or to the headphone jack (or both). 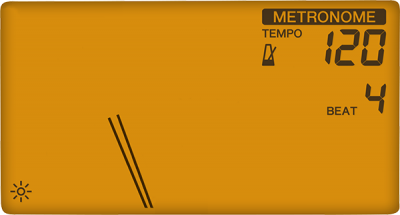 You can set the tempo using three different methods: "pendulum step" lets you increase or decrease the tempo value in the same way as the settings on a standard pendulum-type metronome, "full step" lets you specify the tempo in single-step increments in the range of 30–252, and "tap tempo" lets you specify the desired tempo by pressing the switch in time with the song you’re playing. There are 15 different built-in rhythms* including time signatures from 0 through 9 as well as duplets, triplets, triplets with the middle note omitted, quadruplets, and quadruplets with the middle notes omitted, and the tempo can be freely specified in the range of 30–252 beats per minute. Sophisticated rhythms such as triplets or quadruplets with the middle notes omitted are used in a wide range of styles from classical to rock and jazz. *When using the tuner function and metronome function simultaneously, you can’t specify triplets, triplets with the middle note omitted, quadruplets, or quadruplets with the middle notes omitted.